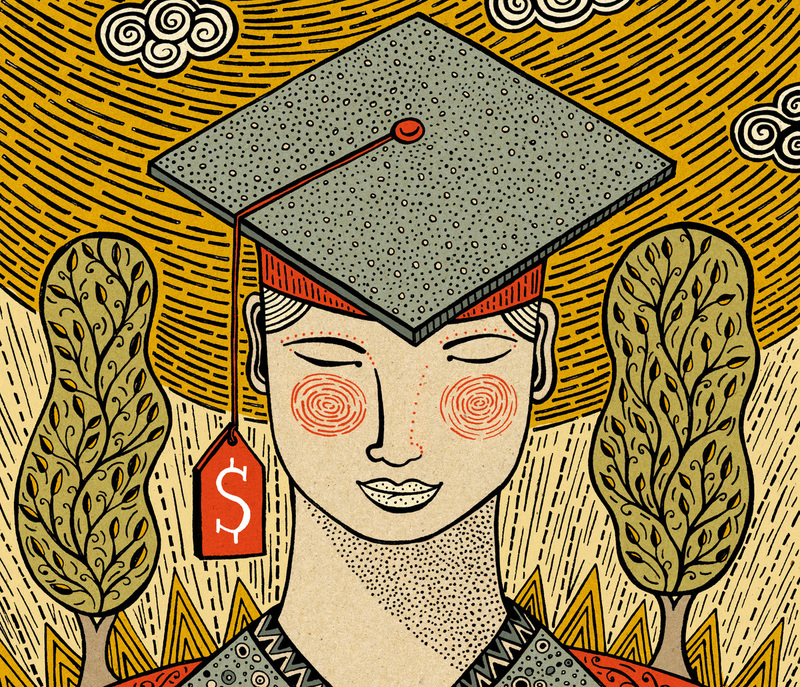 Strategies For When You're Starting Out Saddled With Student Debt More people have more student loan debt than ever; last year, the average for a college graduate was more than $35,000. Here are some ways to set priorities for attacking that debt. When Samuel Smith graduated with a master's in engineering from Cornell, he thought the $190,000 in debt he incurred would pay off. But it took him a while to land job at a software firm in Austin, Texas. And now, after paying $1,750 a month in loan payments, rent and food, he says he doesn't have much left over. He doesn't own a TV and says "it'd be nice to go out for drinks once in a while." More people have more student loan debt than at any time in history. Average student loan debt has tripled since the mid-1990s. Last year, the average student debt for a college graduate was more than $35,000, according to Mark Kantrowitz, a student loan expert at Cappex, which connects students with colleges and scholarships. Loans that hefty can take decades to pay off, affecting careers, homebuying and family plans. Chris Costello, CEO of Blooom, a personal finance advice firm targeting lower-net-worth people, advises his firm's clients to tackle student debt with this strategy. First, if your employer matches contributions to a retirement plan, such as a 401(k) or 403(b), max out on the matching contributions. After maxing out on the matching contributions, pay off the debt with the lowest balance. Check to see if you can qualify for loan forgiveness, refinancing or debt consolidation. Do not incur new debts: in other words, live below your means. Smith, 26, laughs bitterly when asked about his earlier, carefree days. Replacing the tires on his car wiped out his checking account and ran up credit card debt. His debt burden, he says, has become a psychological burden. "The best way I can handle it is to try to not think about it. Because when I do start thinking about it, I have some serious panic attacks," he says, chuckling. Then he adds more seriously that he's not just joking: "For the past couple days I've been in panic attacks." Experts say studies show rising student debt is limiting peoples' career options. They decide against graduate school. Or feel they can't afford lower-paying public service jobs or the risk of starting a new business. That's a problem, because new companies create new jobs. Chris Costello, CEO of Blooom, a personal finance advice firm targeting lower-net-worth people, says one of the top questions his firm's clients ask goes something like this: "I've got student loan debt. Should I be contributing to my 401(k)?" Many people think they need to pay off the loans first. But Costello says if your employer matches contributions to a retirement plan, such as a 401(k) or 403(b), it would be crazy not to take advantage of it. "Please, please do not leave those free dollars on the table," he says. But after maxing out on the matching contributions, Costello advises paying off the debt with the lowest balance. Some advisers say target the one with the highest interest rate, but he says there are psychological benefits to tackling the smallest balance first. Can I Consolidate My Student Loans? Debt consolidation can be a real thing; it can also be a scam. It's a real thing when you consolidate your federal student loans into a single direct loan, held by the Education Department. This can simplify your payments and make you eligible for more repayment programs. It's a real thing also when you consolidate your private student loans by taking out a new loan from a reputable bank. This may or may not save money, if the bank offers a lower interest rate on the new loan. It also may simplify payments. It's a scam, says the National Consumer Law Center in a 2013 report, for companies to charge high upfront fees to "help" you consolidate your student loans. Or to claim any government affiliation, such as that they are an "approved servicer." Or to advertise that they offer exclusive access to plans that are really government repayment plans — such as income-based repayment, which is available free to anyone. It may be a scam when someone wants you to consolidate your federal loans into a new private loan. Private loans can, in limited cases, be cheaper. But federal loans have more protections for borrowers. "It's called the debt snowball method, and it's an easy way to build momentum and mental confidence that you're actually making progress in getting debts paid off," Costello says. Debt counselors also say graduates with debt should see if they can qualify for loan forgiveness, refinancing or debt consolidation — all while not incurring new debts. In other words, he says, live below your means. Greg Deckard and his wife are trying to do all that. They live in Mobile, Ala. And he recently went back to school to get a software engineering degree. But now they owe $126,000 in student loans on top of a mortgage and day care for two kids. "If I go with a 20- to 25-year plan, then I'm in my 60s when I finish paying. I'm 42 and I have very little saved for retirement," he says, let alone for his kids' college education. Sheila Bair, a former head of the Federal Deposit Insurance Corp., dealt with the aftermath of the mortgage crisis. Now she is the president of Washington College in Chestertown, Md., and is focusing on the problem of student loan debt. Bair has frozen tuition increases at her school. And she criticizes student loan policies that make it too easy to borrow and too hard to pay back. Bair, an adviser to Costello's firm, Blooom, advocates having more federal loan programs that cap monthly loan payments at a certain percentage of their income. "That way, students that want to be social workers, or work for nonprofits in the inner city, they will only have to repay what they can afford to repay," she says. That would benefit Rosette Cirillo, an inner-city teacher in Chelsea, Mass., who is the first in her family to go to college. She jokes about the $120,000 in college and grad school debt: "Oh, it's my tax on trying to become part of the middle class." And it's an especially annoying tax, because she says even though she is making her payments, for a time she received hundreds of mistaken collections calls. "My phone [was] buzzing in my desk while I was teaching, 10 times a day," Cirillo says. "There's not time to stop thinking about it," she says of her debt burden. Nevertheless, she tells her students to go to college — because it leads to better careers. "I taught 12th grade last year," Cirillo says, "and I told them the same thing: 'Go.' "
But these days, it's hard not to consider the price.